Tag line: "Not recommended for people of nervous disposition"
This is the movie that started it all. 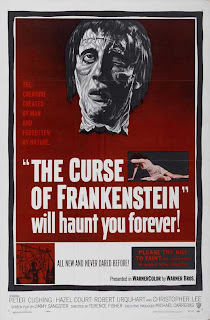 The very first Hammer horror film ever produced, The Curse of Frankenstein kicked off a cinematic love affair between studio and genre that would continue for the better part of two decades. While in his prison cell, awaiting execution, a frantic Victor Frankenstein (Peter Cushing) tells a priest (Alex Gallier) what it was that brought him to this lowly state, of how he ignored the warnings of his good friend and teacher, Paul Krempe (Robert Urquhart), and assembled a man from body parts he had harvested from the dead. What's more, he was able to bring this “man” of his to life! Frankenstein's goal was to construct the perfect human being, one possessing both physical strength and a geniuses intellect. He resorts to drastic measures to see his dream become a reality, going so far as to murder the aging Professor Bernstein (Paul Hardtmuth) so he could have access to his superior brain. With Frankenstein's behavior growing more erratic every day, Paul tried to convince Elizabeth (Hazel Court), Frankenstein's fiance, to flee the castle for her own safety. But when Victor's “creation” (Christopher Lee) finally breathed life, it was too late to save any of them from the horror. Though not as iconic as the monster played by Boris Karloff in the 1931 classic, Christoper Lee's creature in The Curse of Frankenstein is more faithful to what Mary Shelley, the author of the original novel, had in mind (she described the monster as having “yellow skin” and hair that was “black and flowing”). 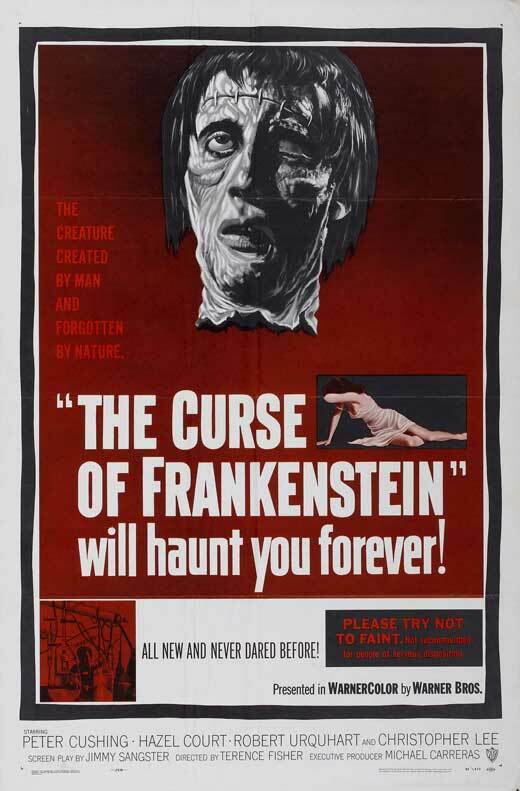 But unlike its Universal Studios counterpart, The Curse of Frankenstein isn't so much about the creation as it is the creator. Cushing shines as Victor Frankenstein, a man obsessed with his desire to produce life. He argues with Paul over the moral dilemma of harvesting parts from the dead, which Victor feels is perfectly acceptable, considering the scientific advances his “experiments” might bring about. In one scene, after the two have stolen the body of a freshly-hanged criminal, Paul points out that birds have already eaten away the man's face and eyes. Quite casually, Victor grabs a knife, and when a shocked Paul asks what he's doing, he replies he's going to cut the head off. “ It’s no use to me anyway”, he says, removing the head and dropping it into a vat of acid. Victor’s unwavering dedication to the task at hand is apparent, and he won't allow anything, not even decency or the law, to prevent him from finishing. Boris Karloff's performance, coupled with Jack Pierce's makeup, made Universal's Frankenstein a movie that will forever be associated with its monster. In Hammer's The Curse of Frankenstein, the scientist takes center stage, and from the looks of it, Peter Cushing was more than up to the task.